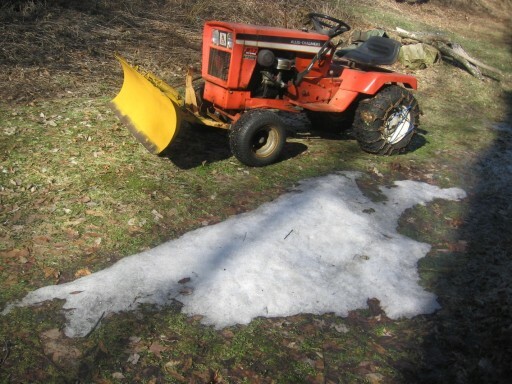 Here is the last patch of snow on my farm. It's a shady area behind my barn. It has been a long winter. I was taking the 917 to the barn for a summer rest, and could not resist taking a picture of the last ( I hope ) snow. the last ( I hope ) snow. Your not the only one Jim! Woke up yesterday morning to more of the white stuff but it was all gone in a couple hours. I am ready to get the mower deck on! We had some fluries here in Cent. Pa. yesterday, I hope that's not a sign of a bad Spring. I'm ready for mowing season, I got me a little mower for my 1/5 acre this past winter hope to post some pics soon.Oh your 917 may be tired but it still looks good!! Yeah I'm not ready for mowing season yet though! Still have to put new bearings in the deck. Grass is already turning... not a good sign. I mowed close w/ Honda walkbehind yesterday...good exercise:D Blade still on tractor, ready for late snow. I've seen doozeys around here end of March. Greg, The cone clutch is not working on the 917. 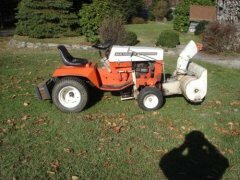 I have a nice HB-212 to mow with, also our B-210 which we have owned for about 25 years will still lay down a nice stripe. That A/C 917 was a wreck when I got it. 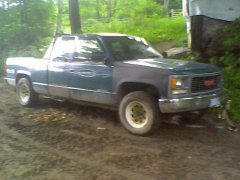 It had a twin Kohler with problems, a homemade plow hitch welded to the frame, broken steering wheel, just to name a few of it's little flaws.8C I got a dash tower and steering parts from Sandy Lake, added a Briggs and built a decent plow tractor. I love the Sunstrand for snow plowing.